Nice movie, action from start to end. At the end of the movie, I just sat there and stared at the screen and asked myself, "what the hell was that all about? It just leaves you hanging, do not see this movie, even if it free! Walberg annoyed me no end, like he was trying too hard. Confusing, annoying, not worth it (to me) movie. I love action movies, but this one did not hit the mark for me. I think I was distracted by all the elastic snapping!!! Over the top with killing and destruction. So, if you like a movie of nothing but action, killing, crashes, inane dialogue, cursing and a hard to follow plot based on the above...this is your movie. Walberg plays a guy with no redeeming value; see at your own risk. What a mess! Walberg reached his peak in The Fighter and has been going down hill ever since. I could not follow the story line. Very disappointing. Wahlberg just in it for the money on this one. Don't pay to see this. I did not find this movie disappointing. I was able to hear their conversations and understand the plot. Having said that afterward I felt like seeing the movie again for clarity. But I was able to follow the storyline well. 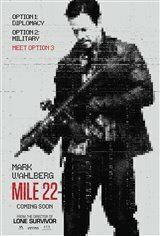 This movie is about a snippet of time being the time it takes to get to Mile 22. This movie is about and focuses on the character that Wahlberg plays. This movie focuses the character's personality traits. It is about a triple agent. It is about people in crtical jobs having personal issues. I liked the twist at the end. All the actors and actressrs did a great job. I recommend this movie. A disappointment! Difficult to follow and little,if any, storyline. Only good thing about this movie.... it was only 94 minutes wasted. Weak story, weak acting. A disappointing movie. Why? There is no plot. I'm serious, the story is non existent. Are there interesting characters? No. Is it violent? Yes, and almost gratuitously so. Is there action? Yes and no. The film rolls along from fight scene to crash scene under the guise of a ticking clock but the killing is repetitive and because we really don't care what happens to the characters, the action is boring. Don't say you were warned, folks. Way too much constant cursing which was just too much and not necessary at all. Mark and others talked so fast yelling at others constantly you could hardly remember what they said or why. The constant popping of the rubber band was just so annoying and totally unnecessary. The fight scenes were great. Alleviating these many little issues would have made the movie much better. Great action flick.Don't believe rotten tomatoes. Great movie it's a must see. Awesome movie, don't listen to the critics.. go see this movie! This trailer looked so good but the movie was not so good. The characters seemed so disconnected to the movie. The movie had many unnecessary twist that added nothing more to the already thin plot. I was very disappointed! Hated the way this movie was filmed! Made me nauseous. Storyline was ok but the characters weren’t very likable and often wondered why certain scenes were relevant to the plot..and other than that it was a big thumbs down. A disjointed story and just a bad violent movie that's "nothing new" in plot. Do not see this dog! did not care for this movie, all action, hard to follow the story line, do not recommend. Boring smash-up/shoot-up....convoluted story-line....and very short! Always a blast to watch Mark do his thing. Great action, cool guns and badass tactical twists. Atomic Blonde did better closeup kill sequences, but there's no bathroom break in this flick. Awesome flick ! Lots of action ,suspense ,and a great twist at the end . Great acting by all as well.